For those of you that haven’t heard, I recently decided to take the entrepreneur leap and open my own company. Sterling Sky Inc will be officially opening as of April 2017 with me (Joy Hawkins) as the sole owner. Consulting. This has really been my passion over the last couple years – I love solving challenging ranking issues that are driving other people insane. 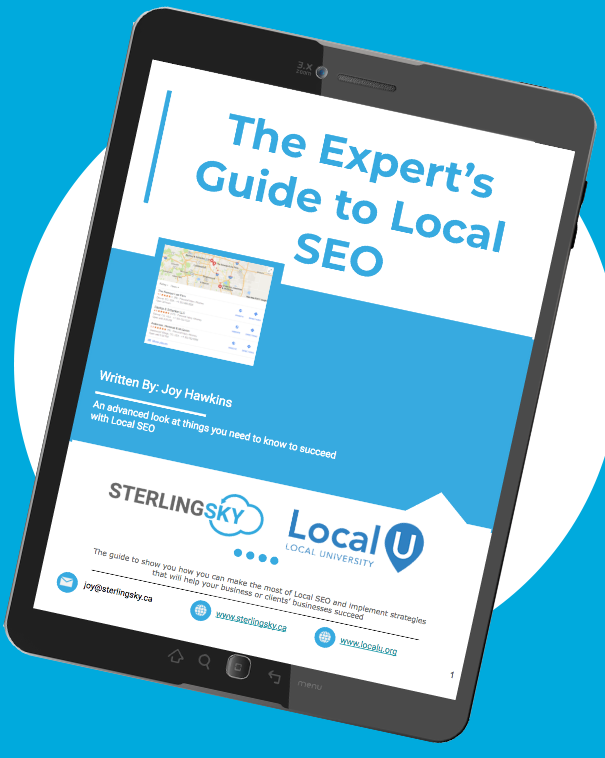 I have worked with tons of business owners and agencies who want a particular issue solved or want advice on something regarding Local SEO. How do you find duplicates now that MapMaker is going away and Google just killed off the classic version of Google Plus? How to deal with competitors that are spamming on Google Maps and getting away with it. How do you deal with suspensions and verification issues with Google My Business? How does the Local Filter work now that Possum has rolled out? If my business has been filtered, how do I get unfiltered? Pay-Per-Click. Ads are everywhere and will probably roll out in the 3-pack this year. Participating is becoming non-optional. Local SEO. Of course, I’ll be taking on a few clients (not many) that I will be doing SEO work for on a monthly basis. If you have any questions for me or want me to get in contact with you, please fill out the contact form on my homepage! I will have more contact information (like a phone number for one) on my website before I launch in a month. Congrats Joy! Best of luck to you! Woot woot! Always appreciate your insight. Best! Joy, I can only ditto what Miriam said. And wish you the best of luck as you break out on your own. Given your passion and work ethic I have no doubt that you will be hugely successful. Thank you Jim! I’m excited for what lays ahead for sure. Congrats Joy. It was surely only a matter of time until you made this step and with you knowledge, reputation & lovely character success will be yours! And you did this while raising your 3rd child. Very inspirational and courageous – I commend you. Hope we can entice you on to InsideLocal when it restarts.